Evergreen Chiropractic is an ICBC approved treatment clinic for patients suffering from motor vehicle accident injury. In British Columbia, patients can get chiropractic treatments through the ICBC flat fee program without paying out of their pockets. Under this program, ICBC pays the chiropractor directly. This program reduces stress from patients and helps creating environment that patient can focus solely on his/her recovery. 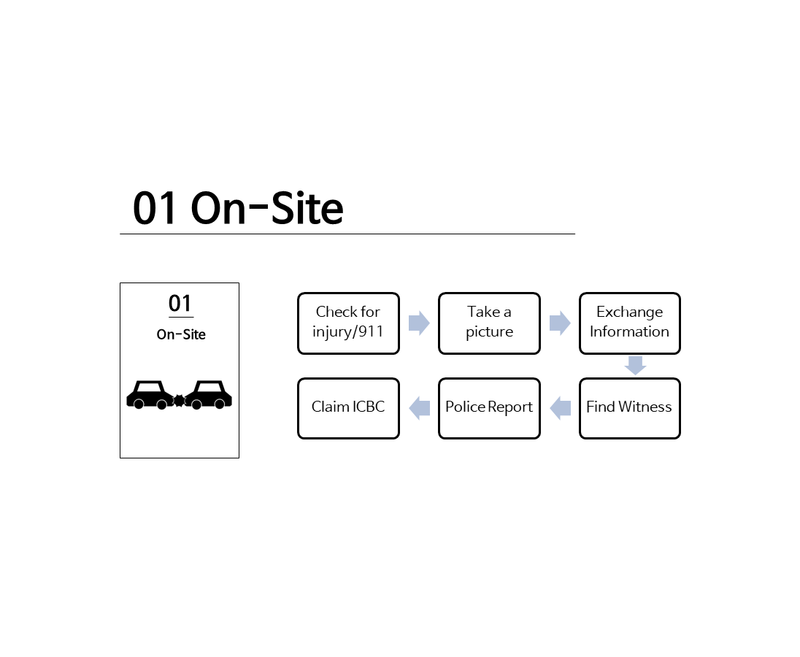 With the ICBC Claim number and date of accident, the patient can get immediate consultation and treatment. Dr. Chris Park is an ICBC Approved Chiropractor, and he is ready to exam and diagnose your condition and initiate your treatment process. ICBC supports treatment cost for virtually any injured individuals involved in a claim. 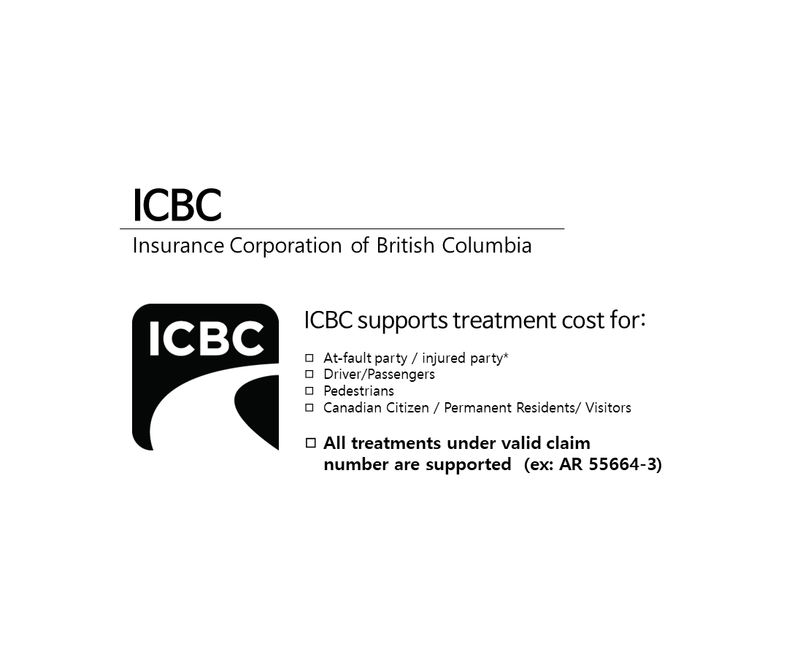 ICBC supports treatment cost whether you are at-fault party, injured party, driver, passenger, pedestrian. They also cover the treatment cost if you are not a Canadian citizen (permanent resident or visitor), if you are properly insured by ICBC (or you are injured by a vehicle insured by ICBC) You need a valid claim number in order to get support for your treatments. Is it your first time getting into accident? You must be frightened and upset. You may not know how to handle the matter. Don’t worry. Here is a step-by-step guideline for anyone got into a car accident. Follow the guideline and handle your claim seamlessly. When you got into an accident, you would be very frightened and shaken up. 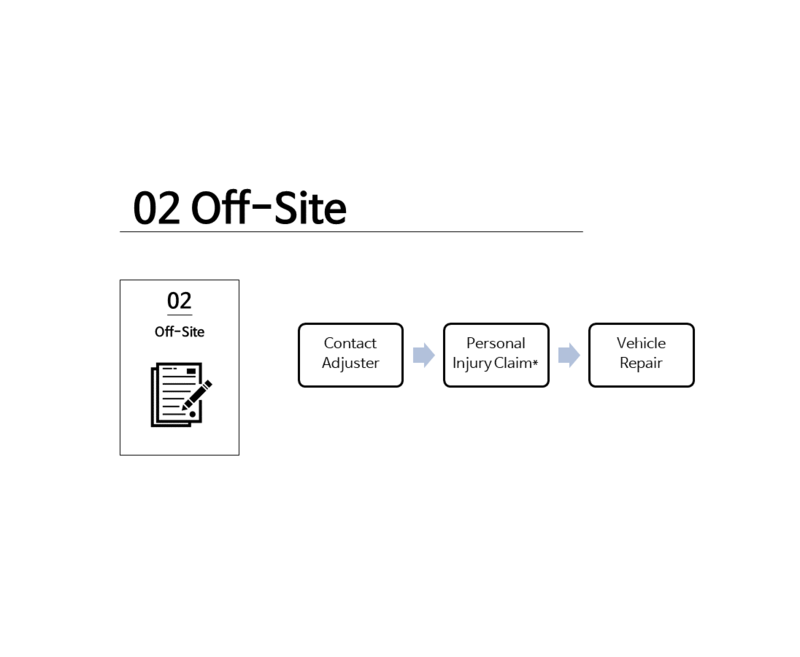 It is very important that you follow the above listed on-site action plans to avoid any possible complications and confusion. First, you should check if there is anyone injured in your vehicle including yourself. If there is any, check their status and call 911 if necessary. We recommend your to take a picture of the scene and the vehicles to leave evidence. Please do not forget to exchange information (contact information, driver’s license, insurance information., etc) with the opponent. It is often very helpful to find a witness, so act fast and politely ask people around the site. You may call police and if they decide to visit the site, then they will issue a police report. The police report contains details about the accident, and it may play important role in your claim. Last but not least, you shall call ICBC and make a claim. Report the situation, mechanism of injury, a number of victims., etc. The ICBC representative will assign you with a claim number and soon will send you the contact information of your handling adjuster. You will be contacted by your claim adjuster usually within 7 business days after you made a claim to ICBC. You may recall how the accident happen and other details regarding the accident to your adjuster. If you are injured from the accident, you should address it to your adjuster. If you do not claim your injury, then your treatments are not supported as they are not reported. If your vehicle is damaged, you may discuss repair options with your adjuster, and get your vehicle repaired by ICBC approved auto body shops. After you are done with “claiming” part, then you would have to meet a physician. You may meet either a walk-in doctor or your family doctor. Family Doctor is usually more preferred if you have one. 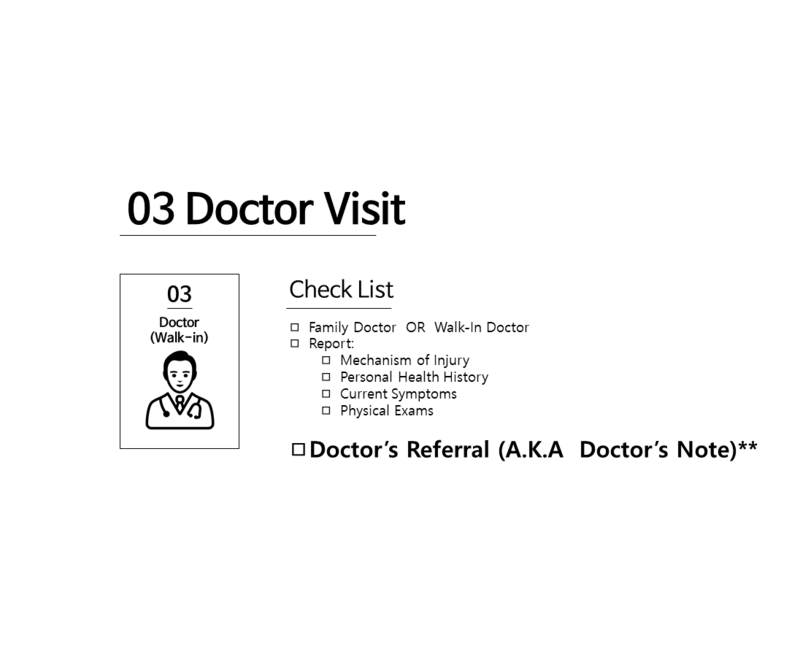 You will report mechanism of injury, previous health history, current subjective symptoms and other details. The doctor will go through a brief physical exam and document all the findings on the chart. The doctor will write you a prescription if you need any medication, and will write you a referral (aka Doctor’s note) for treatments. It is very important to receive a Doctor’s referral in order to receive treatments as there are many treatments that require Doctor’s note. You would need a doctor’s note to support your absence from work or school as well. ICBC covers and supports a various treatment options to accommodate patient’s individual needs. 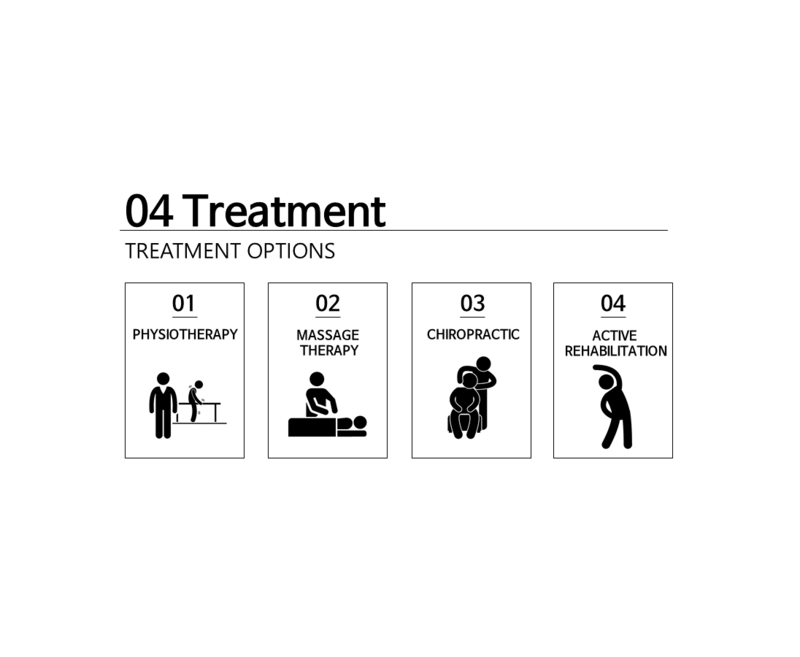 Here are four major treatment options for soft tissue injury: Physiotherapy, Massage Therapy (RMT), Chiropractic, and Active Rehabilitation. Physiotherapy is one of most well-known and well-accepted healthcare discipline when it comes to rehabilitation from physical injury. Physiotherapy is delivered by licensed Physiotherapists. In order to get physiotherapy sessions supported by ICBC, the patient should receive Doctor’s referral for Physiotherapy. Once the Physiotherapist or the clinic submit the referral to handling adjuster, then the adjuster will approve certain number of treatment sessions to be supported by ICBC. 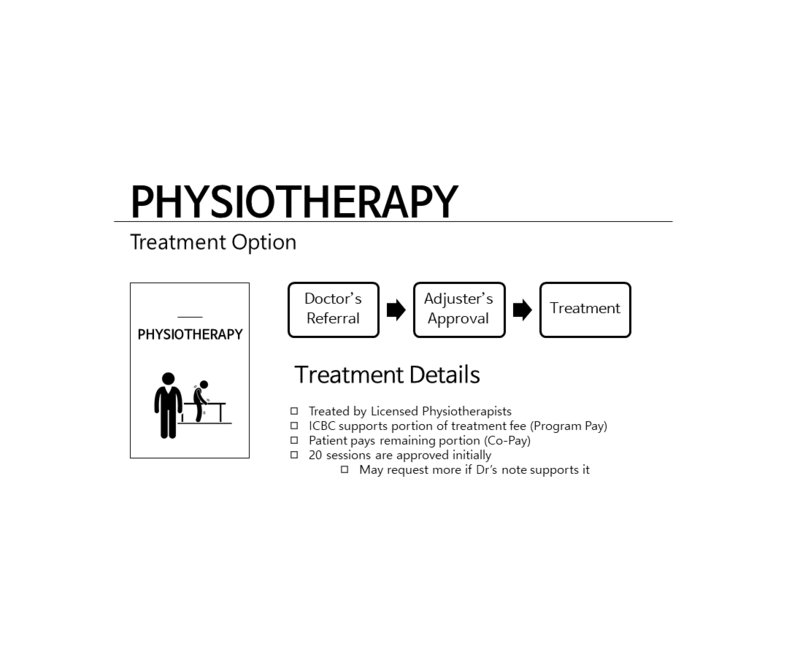 Usually ICBC supports first 20 sessions of Physiotherapy treatments without doctor’s note. If the patient needs further sessions, then they may get more sessions approved by submitted updated Doctor’s note recommending more treatments. Physiotherapy is directly supported by ICBC via fee-per-treatment basis. It means ICBC supports portion of treatments fee (A.K.A Program Pay) while the patient pays the remaining portion (A.K.A Co-pay) Program-Pay may vary depend on a number of body areas treated. Co-pay may vary by clinic-by-clinic. Massage Therapy is another healthcare discipline that is often effective in rehabilitation from physical injury. Massage Therapy that is supported by ICBC must be delivered by Registered Massage Therapists (so called RMTs). 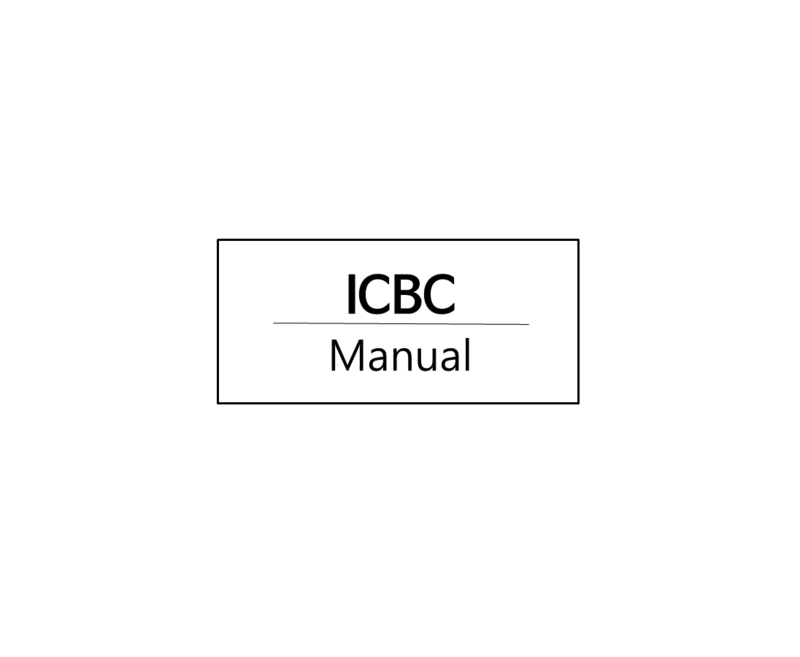 If the patient received the massage treatments from non-RMTs, then the treatment would be directly supported by ICBC. In order to get Massage Therapy sessions supported by ICBC, the patient should receive Doctor’s referral for Massage Therapy . 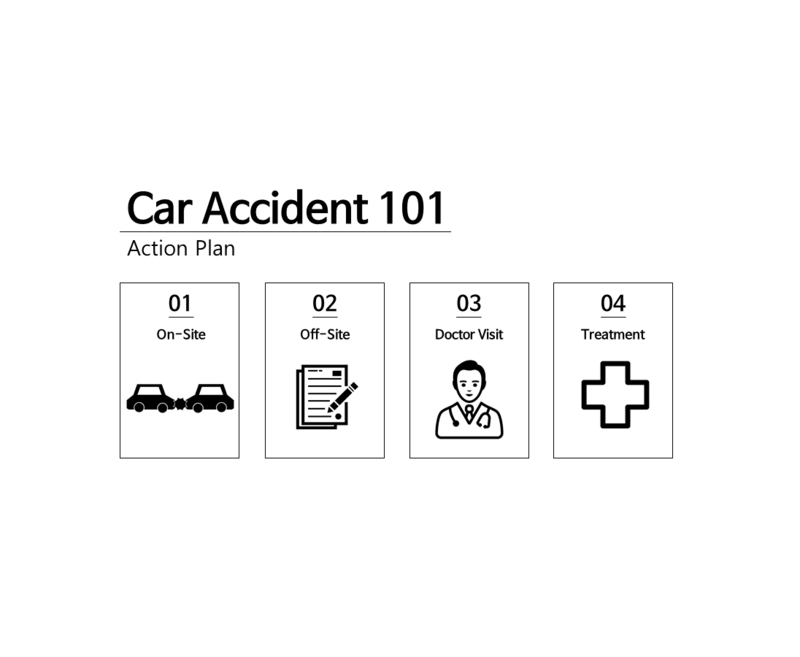 Once the RMT or the clinic submit the referral to handling adjuster, then the adjuster will approve certain number of treatment sessions to be supported by ICBC. 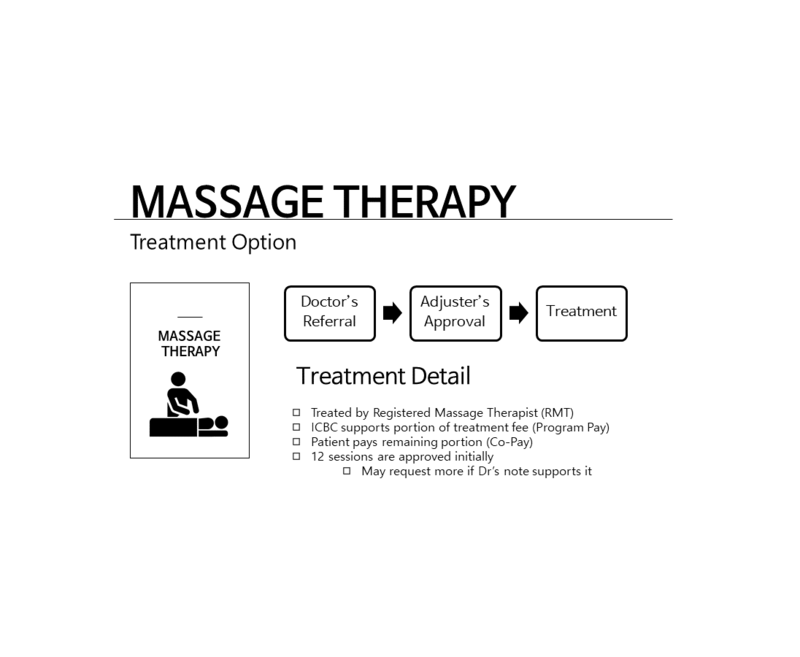 Usually ICBC supports first 12 sessions of Massage Therapy treatments without doctor’s note. If the patient needs further sessions, then they may get more sessions approved by submitted updated Doctor’s note recommending more treatments. Massage Therapy is directly supported by ICBC via fee-per-treatment basis. It means ICBC supports portion of treatments fee (A.K.A Program Pay) while the patient pays the remaining portion (A.K.A Co-pay) Program-Pay is 23$ per sessions. Co-pay may vary by clinic-by-clinic, but usually more than 80$ per an hour of massage therapy. Chiropractic is a healthcare discipline that plays essential role in rehabilitation from physical injury. Chiropractic is unique that they have two separate programs for ICBC patients. 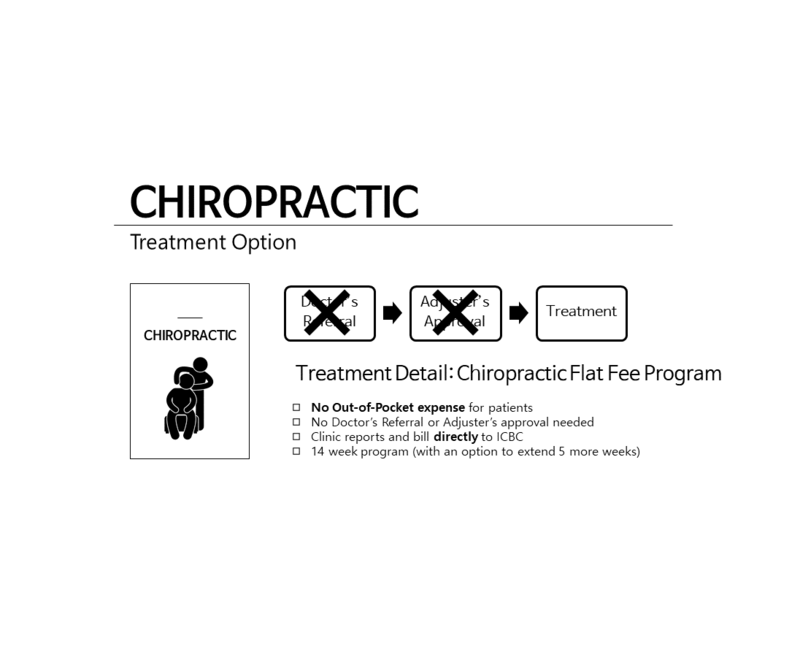 Fee-per-treatment option and Flat-fee option. 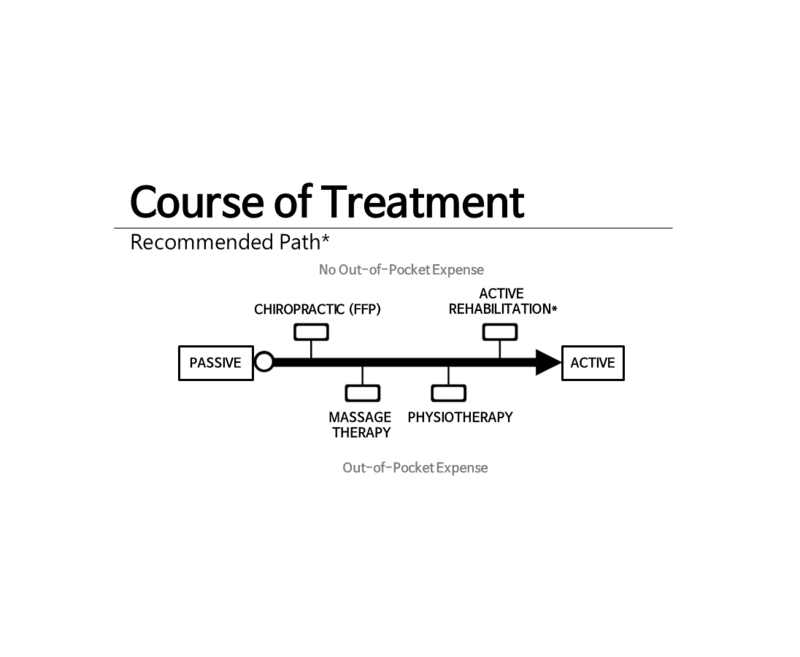 Fee-per-treatment option runs in similar fashion as Physiotherapy and Massage therapy. Partial portion is supported by ICBC (17.35$ per treatment) and the patient pays the rest. Initial 12 sessions are supported without Doctor’s referral. Flat-fee option is a program supports patient’s entire treatment costs over 14 weeks of treatment. This program may be extended for 5 more weeks, if supported by valid report. The Chiropractor will write initial and discharge report for each case and submit and bill directly to ICBC. Patient do not need to pay anything out-of-pocket if they go through Flat-fee option. Chiropractors are primary care physicians recognized in British Columbia, that they don’t require Doctor’s referral to start diagnose and treat patients under Flat fee program. They do not need to get pre-approval from the adjuster to start the program. These advantages allow patients to easily access Chiropractic treatments, and eventually result in faster and efficient recovery from injury. Active Rehabilitation is a exercised-based treatments that often comes in later stage of motor vehicle injury rehabilitation. Active Rehabilitation is delivered by Certified Kinesiologists. The Kinesiologists must possess active membership from BCAK (British Columbia Association of Kinesiologists) In order to get Active Rehabilitation sessions supported by ICBC, the patient should receive Doctor’s referral for Active Rehabilitation. Once the Kinesiologist or the clinic submit the referral to handling adjuster, then the adjuster will approve an initial assessment. The Kinesiologist carefully access current symptoms and functional limitations of the patient and write detailed initial report. After reviewing the initial assessment report, the adjuster will determine how many sessions of Active Rehabilitations to be approved for the patient. If the patient needs further sessions, then they may get more sessions approved by submitted updated Doctor’s note recommending more treatments, as well as progress update by Kinesiologist. Active Rehabilitation is directly supported by ICBC via fee-per-treatment basis. It means ICBC supports portion of treatments fee (A.K.A Program Pay) while the patient pays the remaining portion (A.K.A Co-pay) Co-pay may vary by clinic-by-clinic, it is usually 20 to 30$ session.  Here is recommended course of rehabilitation. 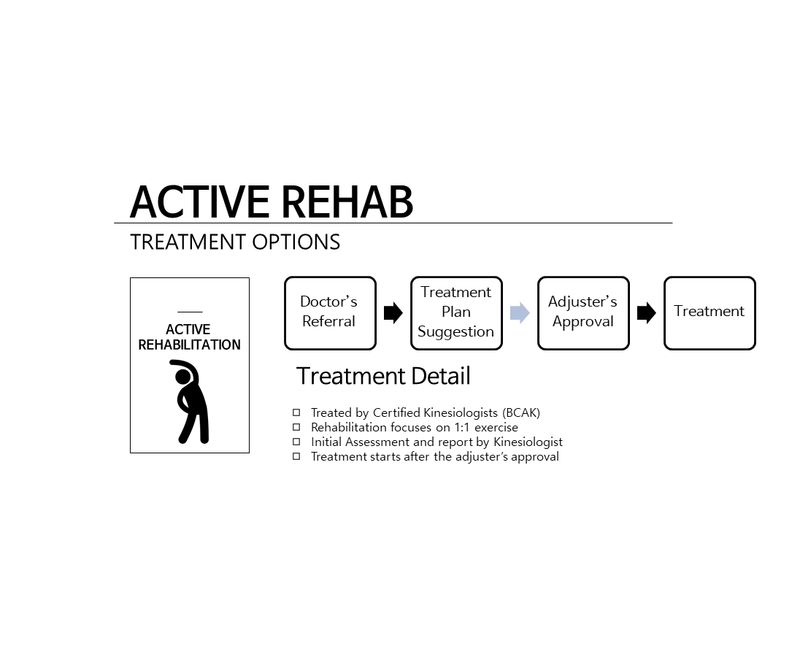 It is just a recommendation; the rehabilitation progress and treatment plans should be individualized, so please take this diagram as a reference. 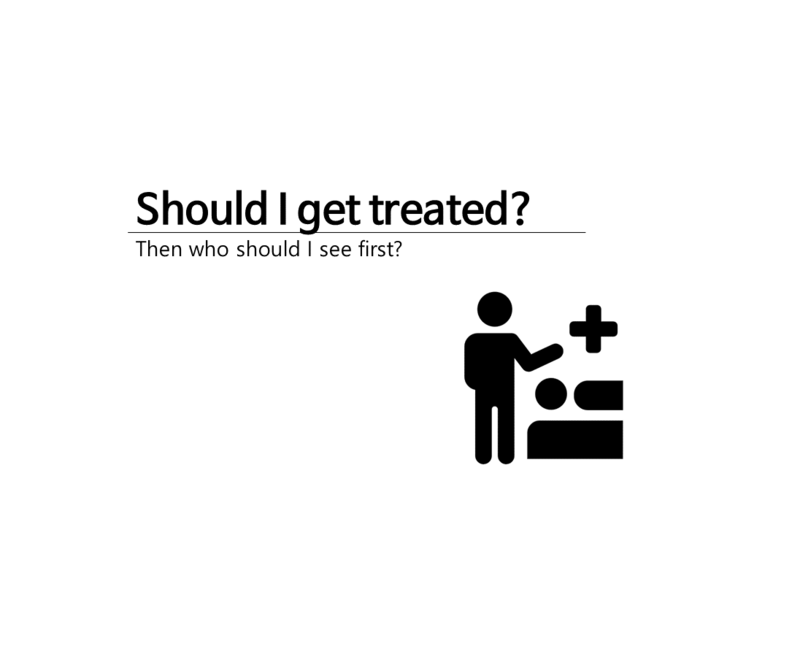 Please consult with your Family doctor or walk-in doctor for the treatment options that would suit you best. We usually recommends patients to seek passive treatments first and progress to more active treatments later for optimal recovery. Chiropractic and Massage therapy would be more passive as patients are passively getting their muscle/fascia released and spine aligned. Physiotherapy and Active Rehabilitation are considered more active, as patients actively move and exercise to regain function. Evergreen Clinic usually recommend patients to seek Chiropractic treatments (Flat fee option) to start the rehabilitation process, due to its accessibility (no referral, no pre-approval from the adjuster) and nature of treatment. (non-invasive) The patient is welcome to seek concurrent RMT sessions along with Chiropractic treatments. Physiotherapy is usually recommended after the patient had their spine aligned and muscle released by passive treatments. Active Rehabilitation would come at the latest stage, and should lead the patients to self-manage their symptoms and prevent further injuries. 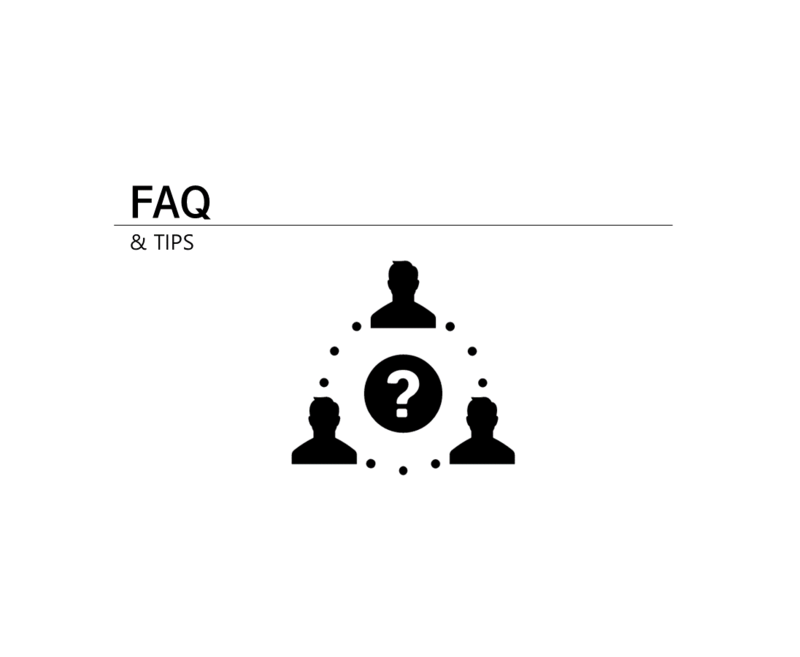 These are frequently asked questions regarding Motor Vehicle injuries. It is often difficult to determine whether you should be treated after the motor vehicle accident. Especially when you don’t have any injuries that would seem ‘serious’ (such as open wounds and fractures) Researches support that patients often get injured even in low-velocity (30 kmph-40kmph) crashes. Soft tissue injuries, concussion, mental disorders that resulted from minor crashes may develop into chronic symptoms. It is very important to seek immediate medical attention from your medical doctor and get through physical exam to get a diagnosis on your symptoms. You may have an initial exam done by a Chiropractic Doctor to screen the risk of further symptoms. The answer is very simple. 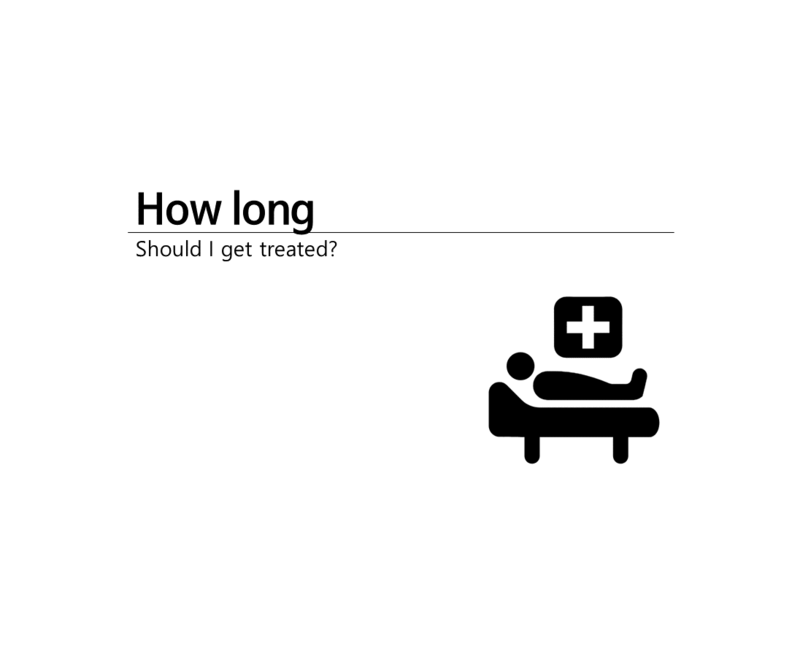 Theoretically, the patient should get treated until he or she has no pain or no functional limitations. By the way, it is often difficult to go back to pre-accidental status even after extensive rehabilitation treatments. In this case, the treatment providers shall adjust the treatment goal to more realistic one. 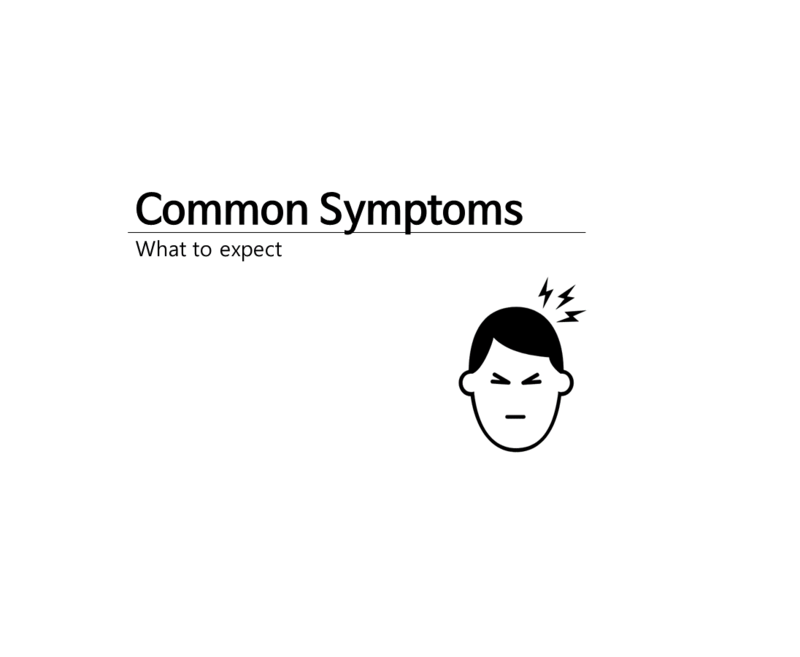 For example, the treatment goal for patient with lingering symptoms shall be helping patients to self-manage remaining symptoms. There is a mis-conception about the insurance premium and treatment. 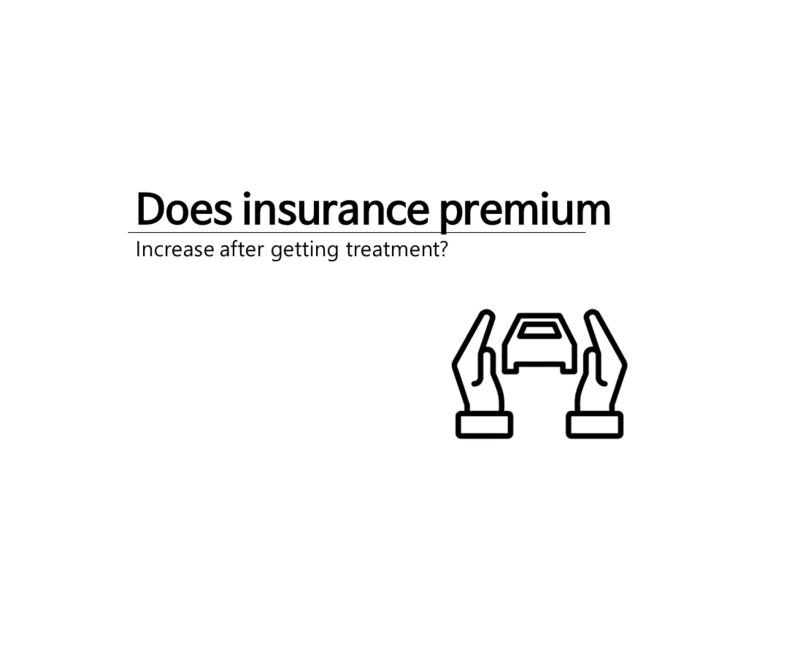 Patients often ask us whether their insurance premium be affected by treatments they are receiving. The answer is no. It doesn’t matter whether you are at-fault or victim of the accident, your insurance premium is not affected by the treatments you are receiving from the accident. If you are at-fault party, then your insurance premium would increase, but the rate is not affected whether you get more treatments or not. Thus, please do get right treatment at right time to minimize development of chronic symptoms. 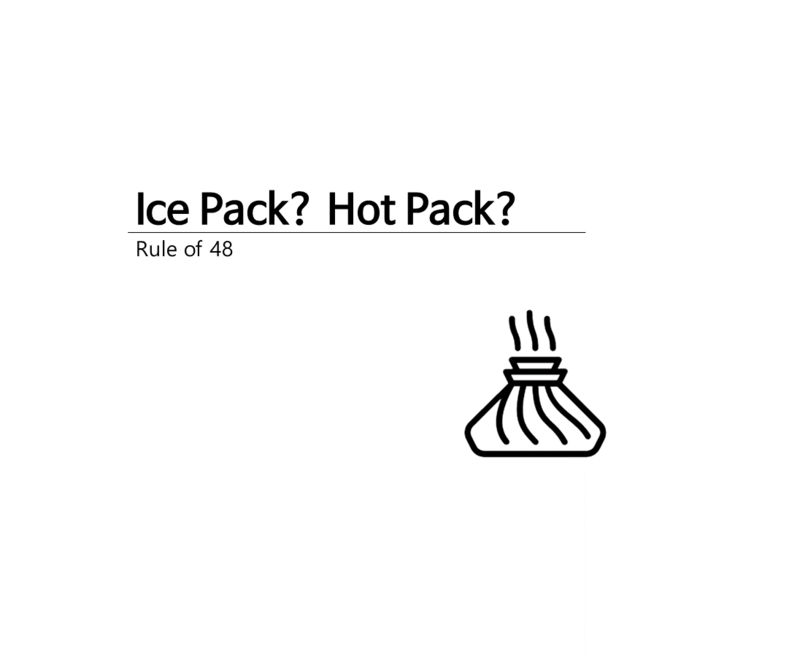 Should I place hot pack or ice pack after the accident? Both Ice pack and Hot pack have their own benefits, but you should use them wisely. Ice pack (cold pack) is more effective in acute injuries and hot pack is more effective in treating chronic injuries or muscle tightness. Thus, Ice pack is usually more recommended in first 48 hours of the injury (accident), as it helps decreasing the temperature and limit the area of inflammation. After 48 hours, the patient is welcome to place hot pack to relieve muscle tension.